So Irish soda bread is one of my favorite breads, it didn’t use to be, but I’ve really liked it lately, so I make it and then put it with soup, I really enjoying making it. I have this memory of me and my grandma Rosa making Irish soda bread, she told me a story about her childhood and she kissed me on my forehead, I loved my time with her she was sweet and kind. She past away this past year, and I’ve missed her. So when I make this bread I think of her and it makes me happy, so here is the recipe! preheat oven to 425 degrees grease and flour the pan I used just a cake pan. Slowly add the milk and yogurt to the flour mix till it’s sticky ball. form a dough into ball then put in pan and press slightly till it resembles a large disk. the should reach the edge of the pan but may spring back. Cut an X on the top of the dough about like ¼ deep. Bake for 30 minutes till its golden brown. Mine took 45 minutes. I hope you guys get some fantastic irish soda bread, which is heavy bread but its great for soups and chili. 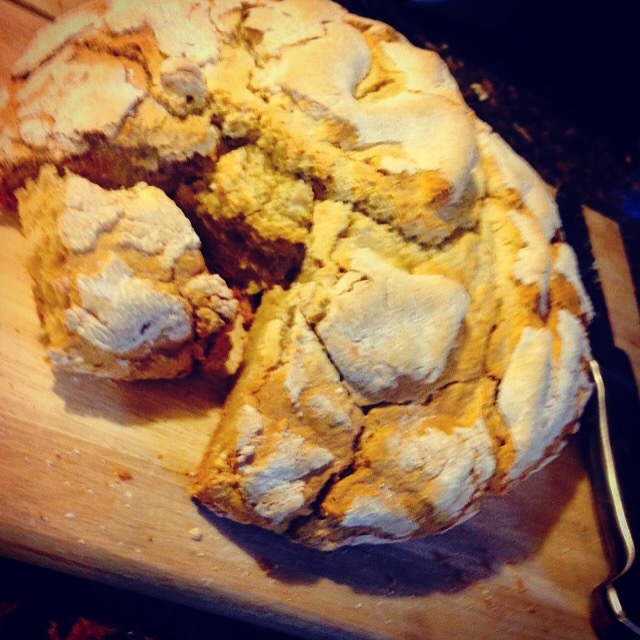 Do note that irish soda bread can be very chewy sometimes but it’s okay. Well everyone have a fantastically weekend!! And Shay-De Foodie Friday! !